We’ve witnessed the growth of the internet and the ever increasing connectivity of people and devices; dynamic intelligence over static intelligence and the borderless over the perimeter. These days we need to adapt to internet scale rather than enterprise scale. Our systems are no longer just on our physical premises, but in the cloud and accessible via the internet – and they are accessed any time, day or night from anywhere in the world. They are accessed not only by employees but contractors, customers and partners. In the not so distant past, you needed to physically carry hardware out of a building to steal information. These days with virtualization, a server can be stolen remotely, simply as a file or accessed and altered in a malicious way. This all adds up to requiring security solutions that are adaptable, scalable and integrated. We need to be able to provide flexible services to meet the operational tempo. They need to be managed in a way that combines encryption, access policies, key management, content security and of course, authentication and authorisation. New threats, risks, and vulnerabilities as well as evolving business requirements underscore to the need for a strong authentication approach based on simple service delivery, choice, and future-forward scalability. Can I address new demands of my business — like cloud and mobile devices? How do I map access control methods to business risk and the needs of my users? Can I centrally manage, control and administer all my users and endpoints? Who controls my user data? How can I incorporate additional security layers to help me further fortify against threats? And how do I keep it all practical and cost-effective? More than ever, customers are looking for data encryption; identity and access management solutions; and identity and relationship management solutions that deliver simplicity, automation, reduced TCO and choice. 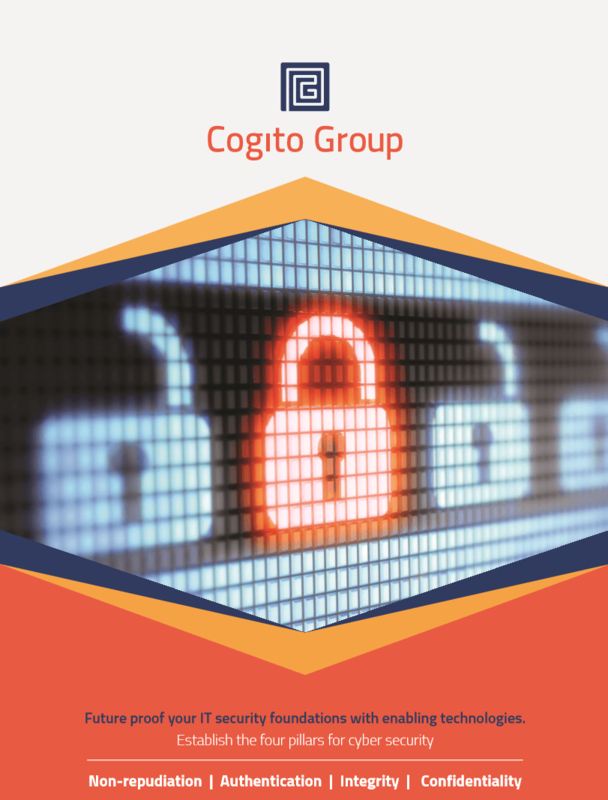 View our Cogito Group Brochure on how to future proof your IT security foundations with enabling technologies through Cogito Group. In this brochure you will also be able to read about our experience, view our products and services and our skills matrix.